This past week I have been working on the doll quilt kits, prepping and cutting tons of tiny pieces of fabric. The one thing I have been putting off is writing the instructions, which is a struggle for me. In this first draft, I tried to come up with a format I could use for all the patterns. Since I absolutely cannot draw at all, I had to use photos. I know I am assuming a certain amount of sewing ability, but I was thinking that anyone purchasing this type of kit would already know how to sew. It’s a lot to ask, but if any of you have a few minutes, I would love to have your comments, suggestions, criticisms, corrections — basically anything. I’m still working out all the little details — I know you’ll all be happy when I stop talking about this, and finally open the stupid shop. 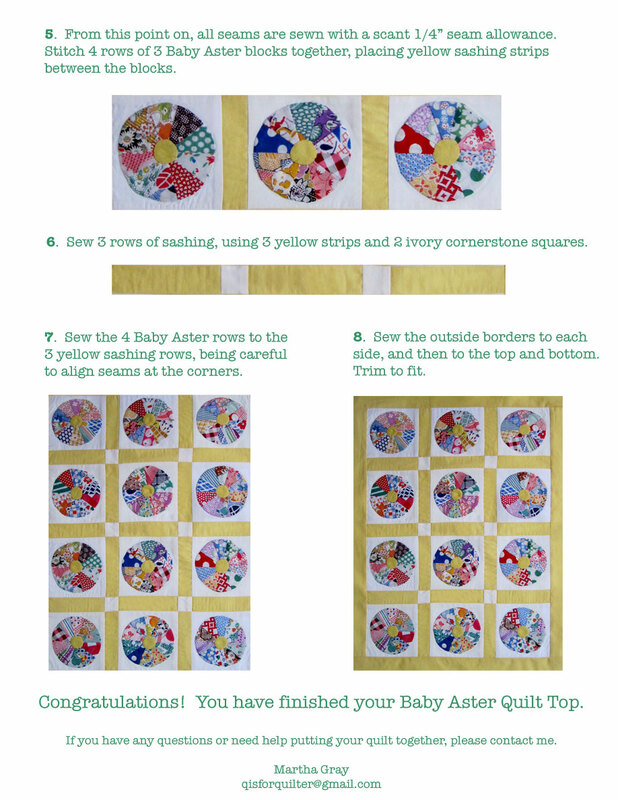 This is my latest idea for a doll quilt kit — a miniature Baby Aster which is basically a Dresden Plate, but without the scallops on the blades. 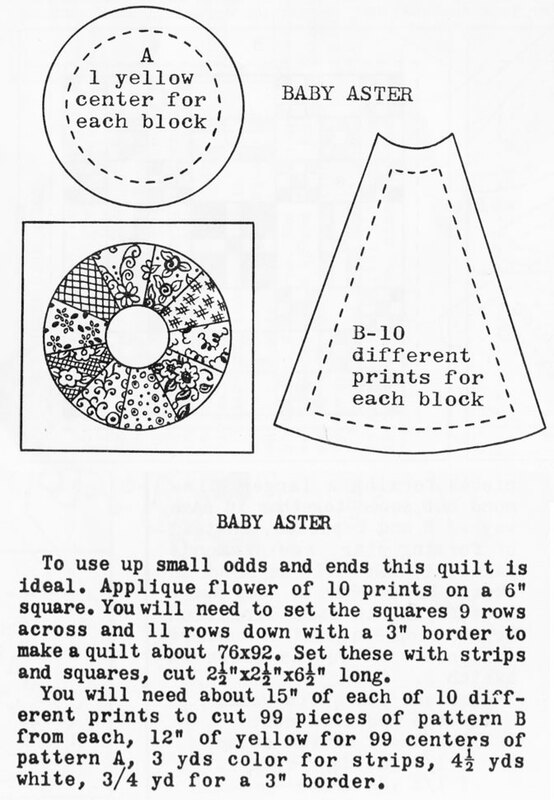 The pieces for this top are actually from some vintage Baby Aster blocks which were crudely sewn. 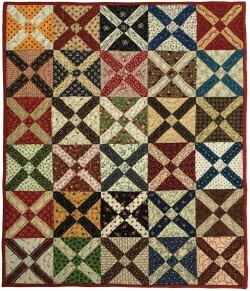 The blocks provided enough pieces to make three more of these tops which finish about 15″ x 20″. 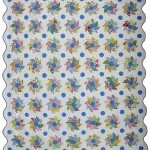 My templates are about 60% of the original pattern size shown below. 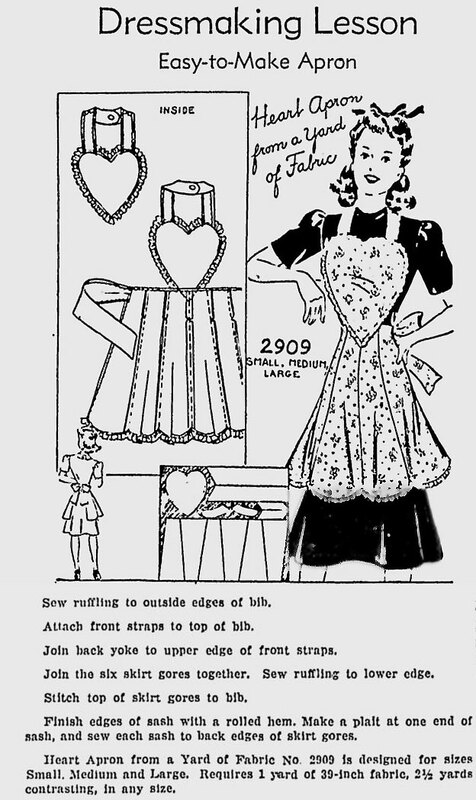 Lately I have been obsessed with browsing antique newspapers, looking for apron inspiration. 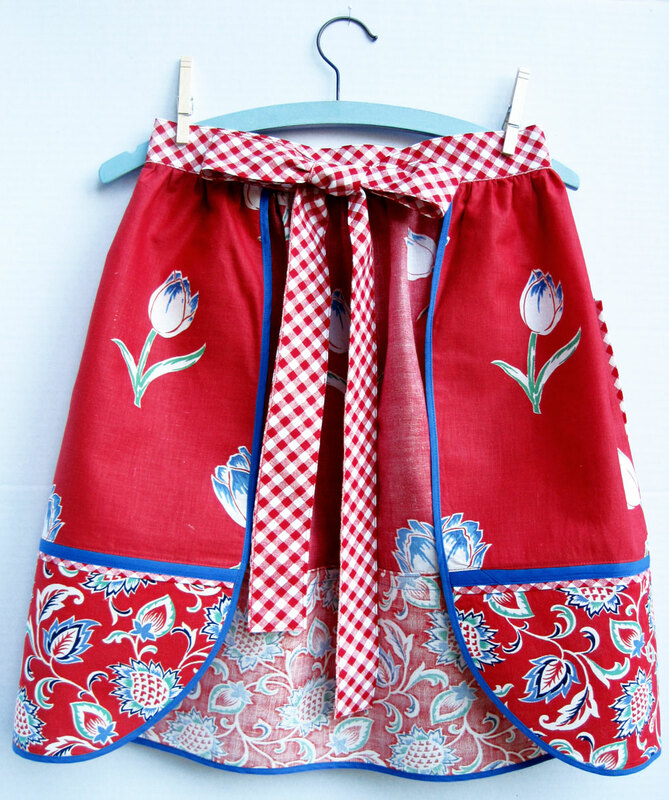 This set of children’s aprons is so cute, that I thought I would clean up the image and share it with you. The directions in these old publications are always so quaint and are usually well written, but inevitably they assume a sewing ability that, unfortunately, many women no longer possess. My favorite thing about this pattern is the illustration of the tools in the “tiny carpenter’s apron.” Those two tools on the right look suspiciously like an awl and a chisel. 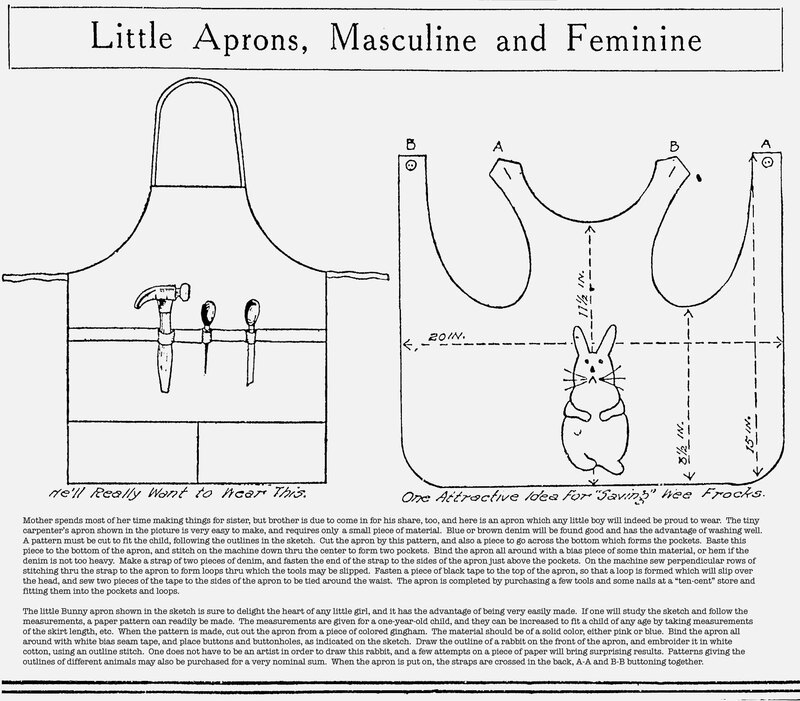 Even for 1919, that seems a little odd, especially since the similarly sized bunny apron is allegedly for a one-year-old. I have retyped the original instructions, which were rather blurry. Click on image to read the text. 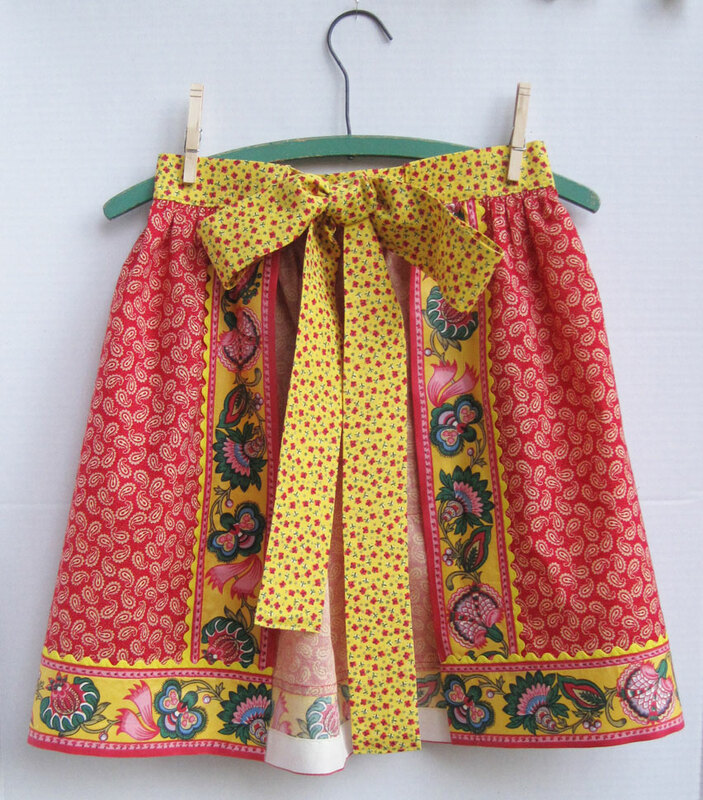 Just a couple more aprons after this, since I already have the fabric selected. 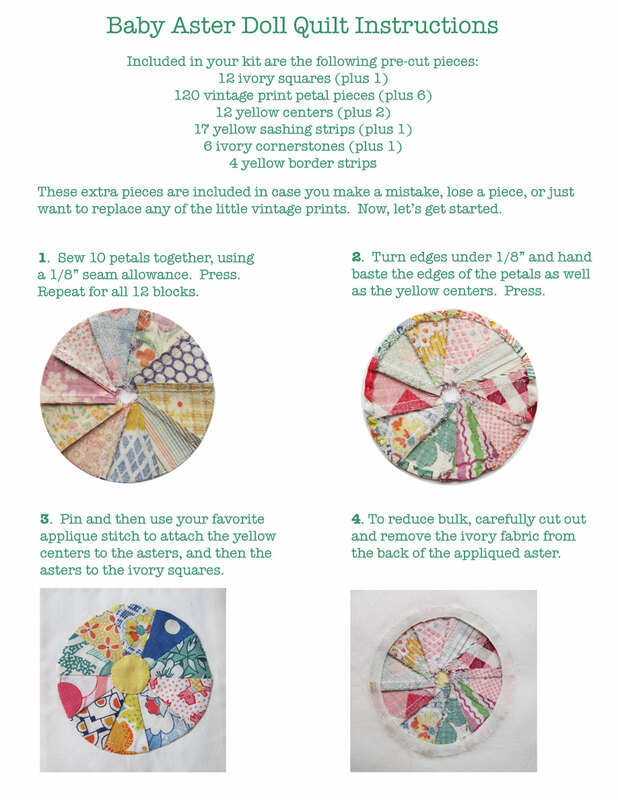 Then I promise to change it up and move on to the little quilt kits. The fabric for this first apron was advertised as a cutter luncheon cloth. 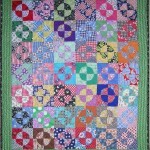 It was homemade using medium weight fabric that I think had faded evenly over time. Still, it is such a pretty print, and has a nice soft look. Although there was one stain and one tiny hole, I was able to cut around them. 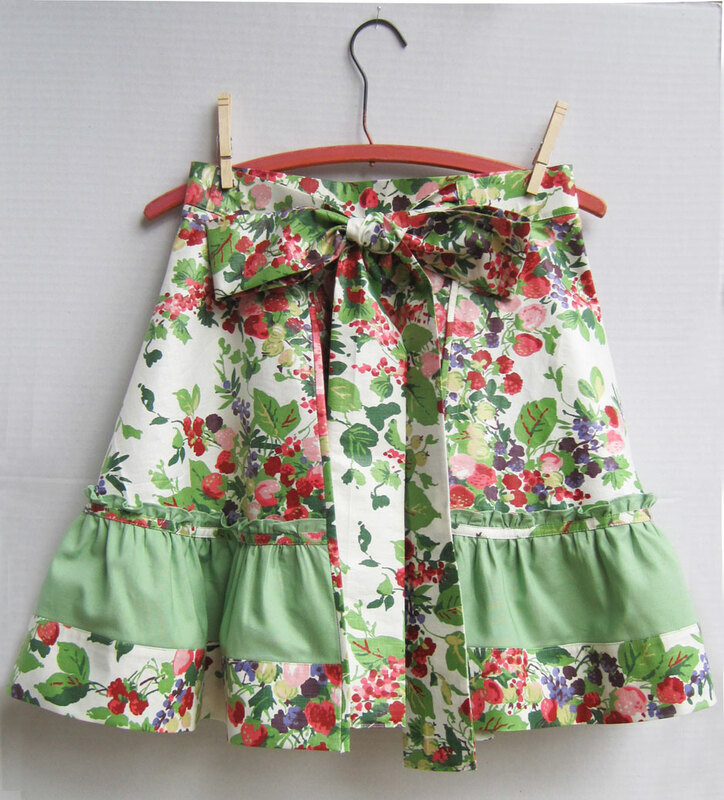 The floral fabric on the pockets is also vintage, while everything else is new. Although you can’t tell from my photos, I always line my apron pockets with a different, coordinating fabric. 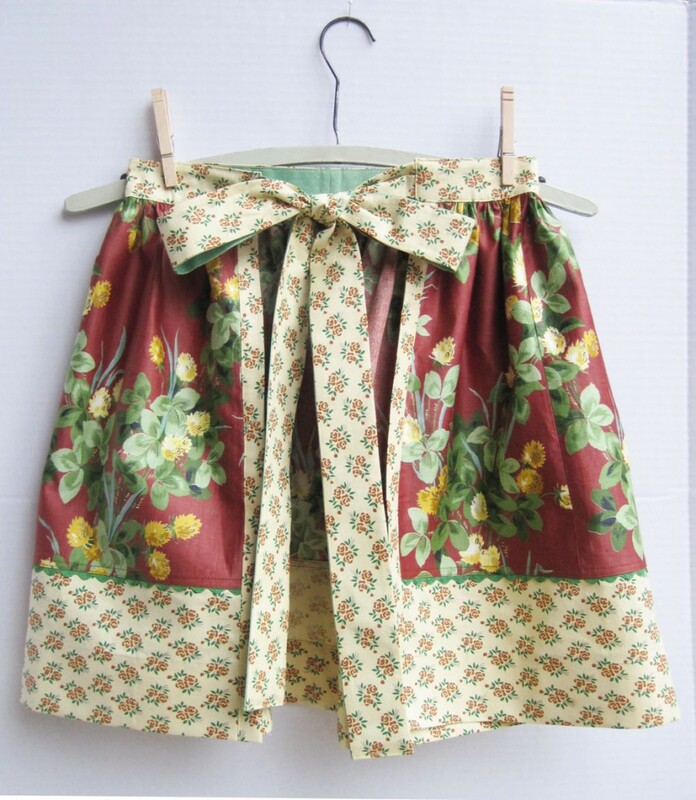 This apron is made from a vintage Waverly chintz sales sample. 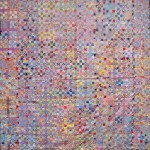 It had two big grommets in either side and was a large sample at 26″ x 36″. 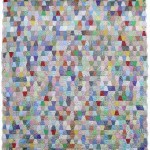 I am very fond of this clover print with its unusual colors. 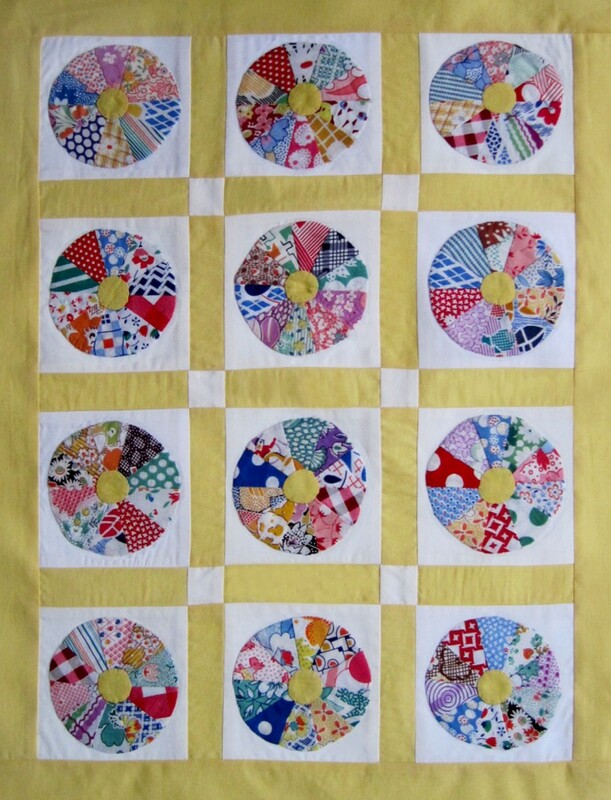 The pale yellow floral is also a vintage fabric, probably from the 1950s. The pocket on this apron is very generous, to say the least. You could probably fit a small dog in there, just in case you wanted to cook with your chihuahua. 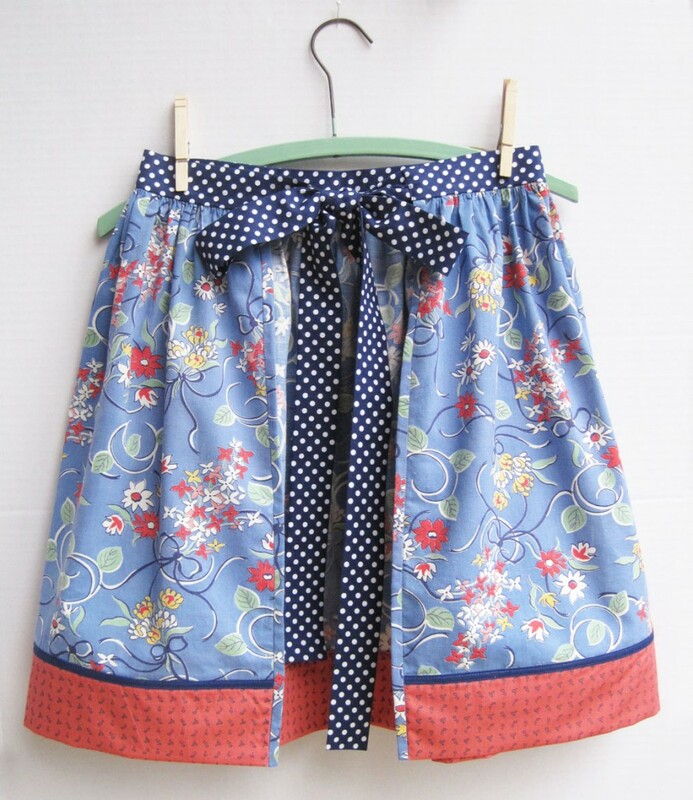 This set of aprons was really fun to make because I had more fabric to work with. Vintage chintz is pretty much my favorite fabric to use in aprons. It’s especially nice if the piece hasn’t been washed and still has its original finish (like the strawberry fabric), but chintz is still pretty even if it’s used and soft. 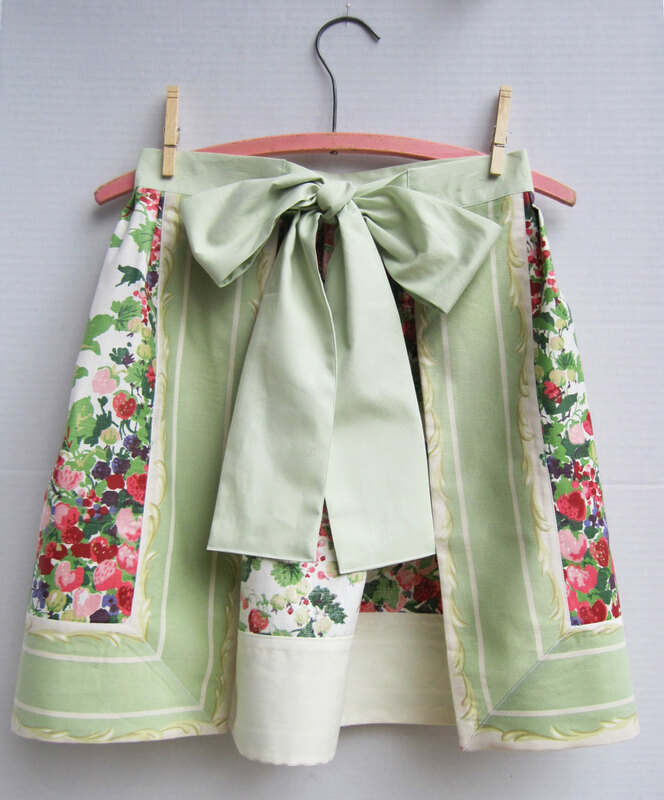 On this apron I had enough of a pale green striped chintz to actually make a mitered border. 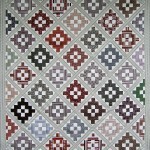 The border print has a little more heft to it, almost like tablecloth fabric. Unfortunately, there wasn’t nearly enough for a sash, so a piece of bed sheet was substituted. 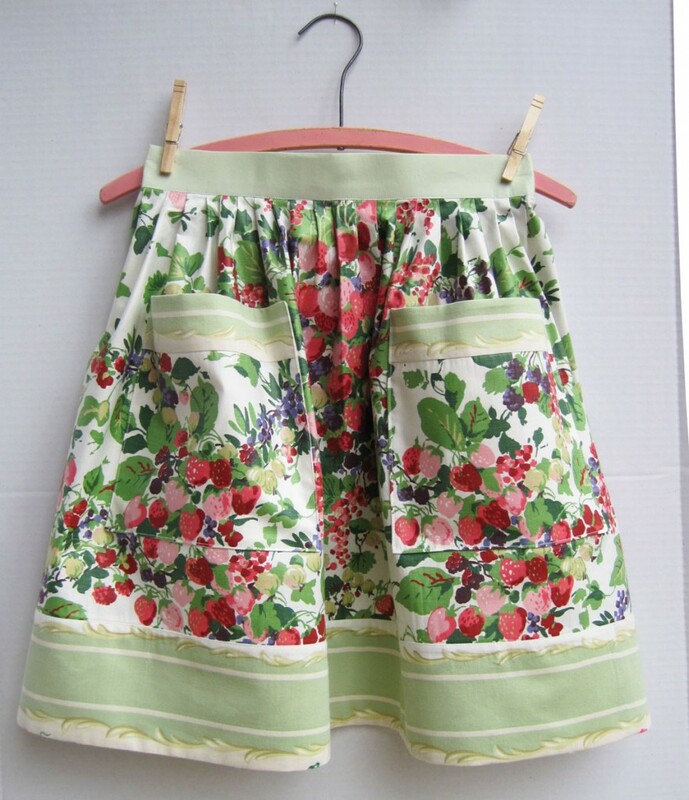 The skirt on this one is pleated, rather than my usual habit of gathering. I hope people won’t mind that I am often forced to make seams in places you might not expect, which is just something that happens when you are working with odd shapes and limited amounts of fabric. 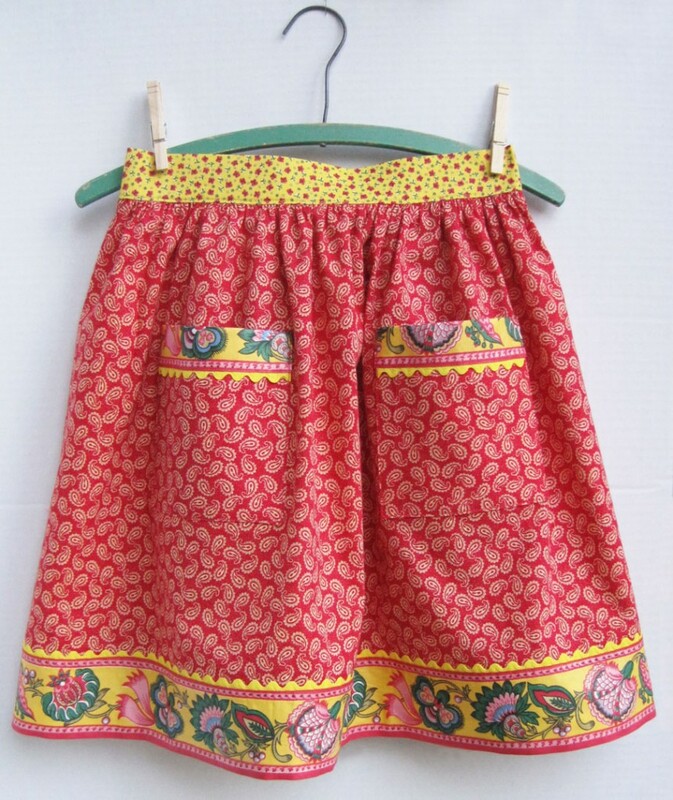 This is a circular skirt, a new variation that I haven’t tried before. Of course, when you’re cutting this pattern from 36″ wide fabric, the circular skirt is going to be a little short, so you have to add a ruffle or a border of some kind. 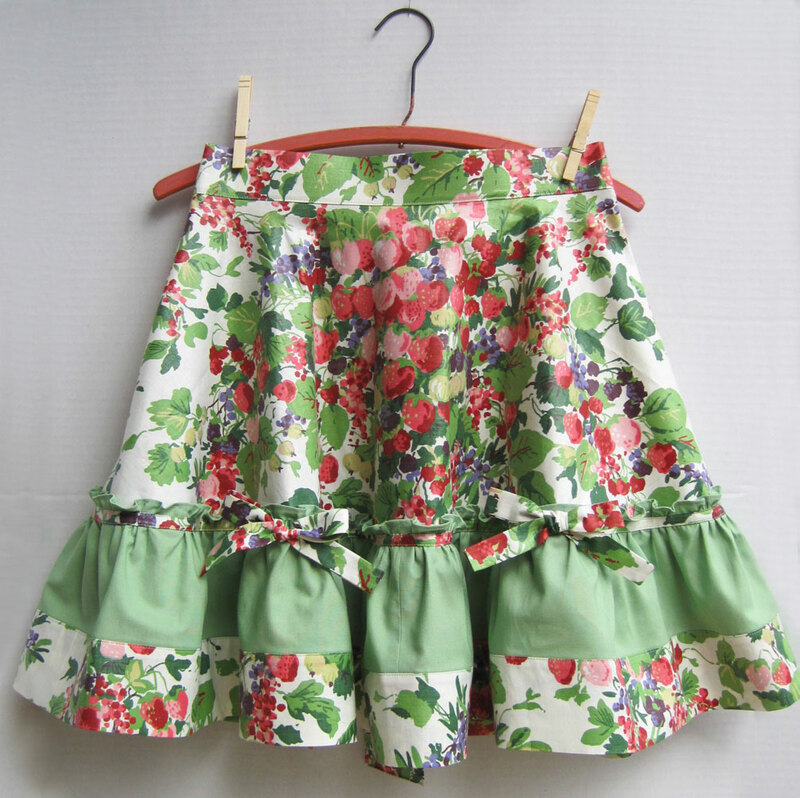 Most of the strawberry print ended up in this apron, because ruffles use a lot of fabric. 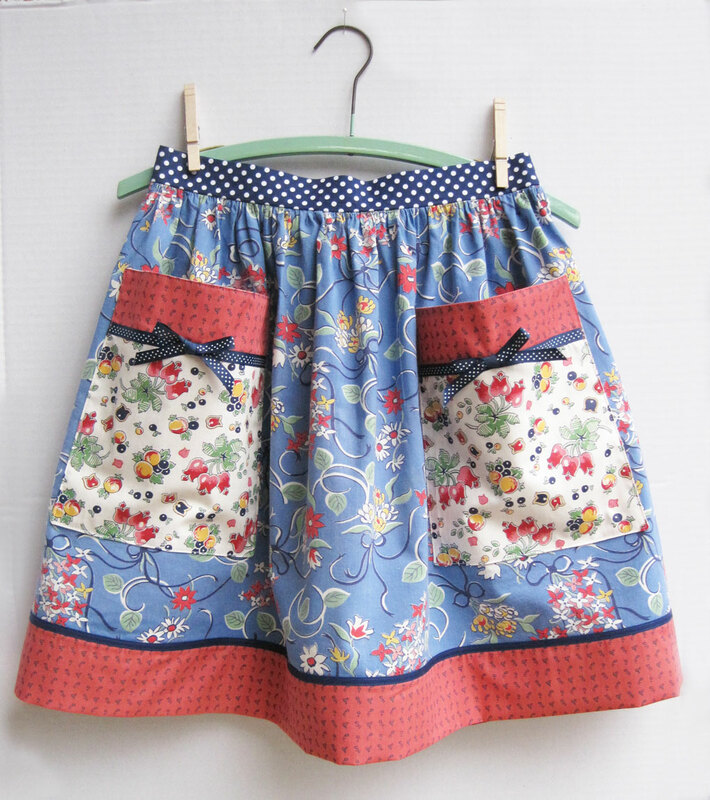 I prefer to wear a closer fitting apron, but the fuller styles are so pretty and feminine, and almost look more like skirts than aprons. At the bridal shower, I think the bigger aprons were picked first. 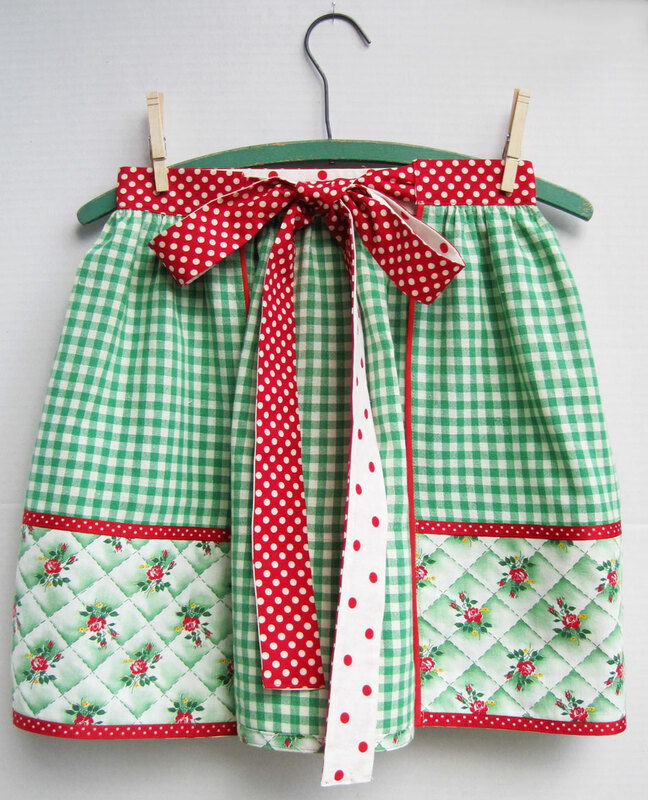 I hope you are not getting sick of looking at these aprons, because I am clearly on a roll here. This cute vintage geometric print was purchased in a cool thrift shop in Arcata, California on one of our road trips down the coast highway. 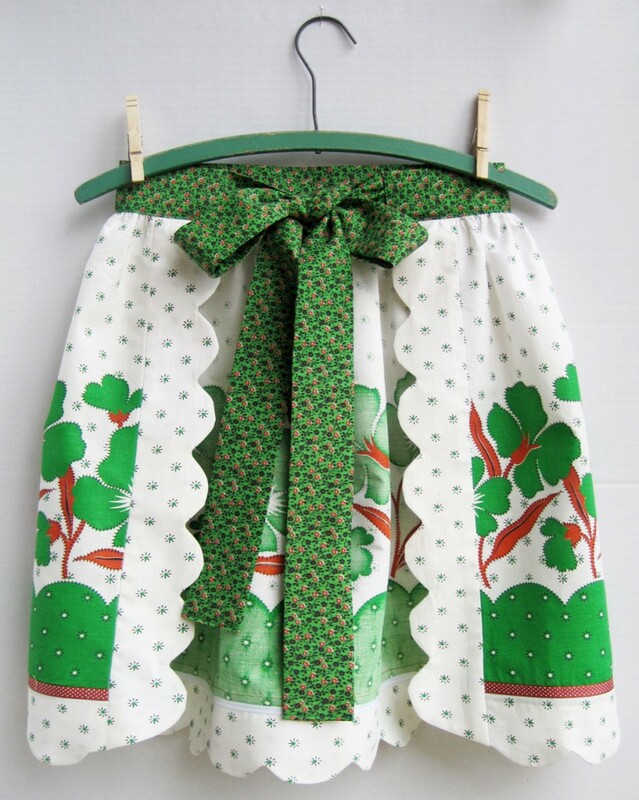 The combinations on this apron are a little odd, but it’s actually one of my favorites. 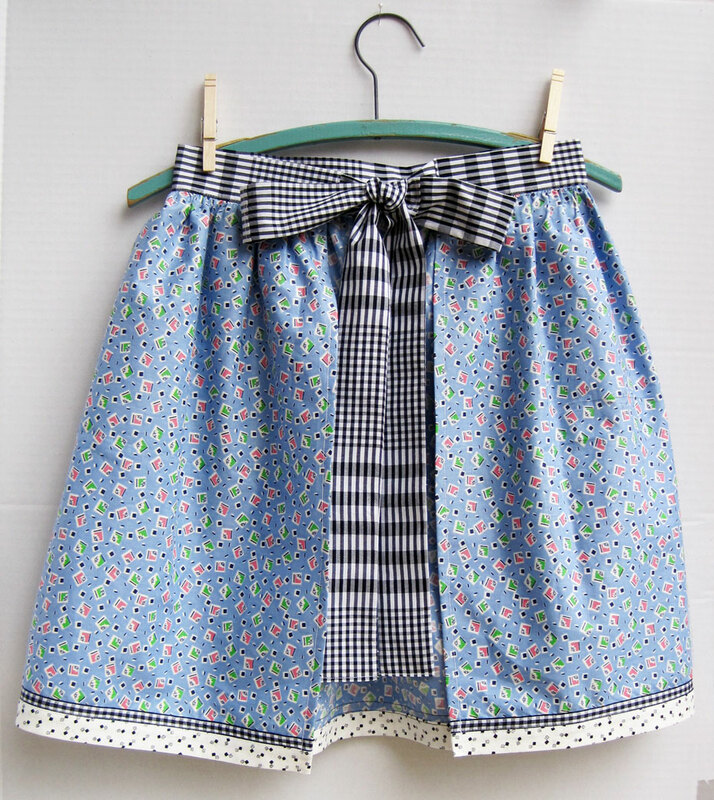 The pockets are also vintage fabric, but the black and white fabrics are new. After some serious scrounging to find something for the sash, I was so happy to finally find a black and white shirt that Elliott left in his old room. No fabric is safe here, although family clothing is usually a last resort. It’s all about the hunt! 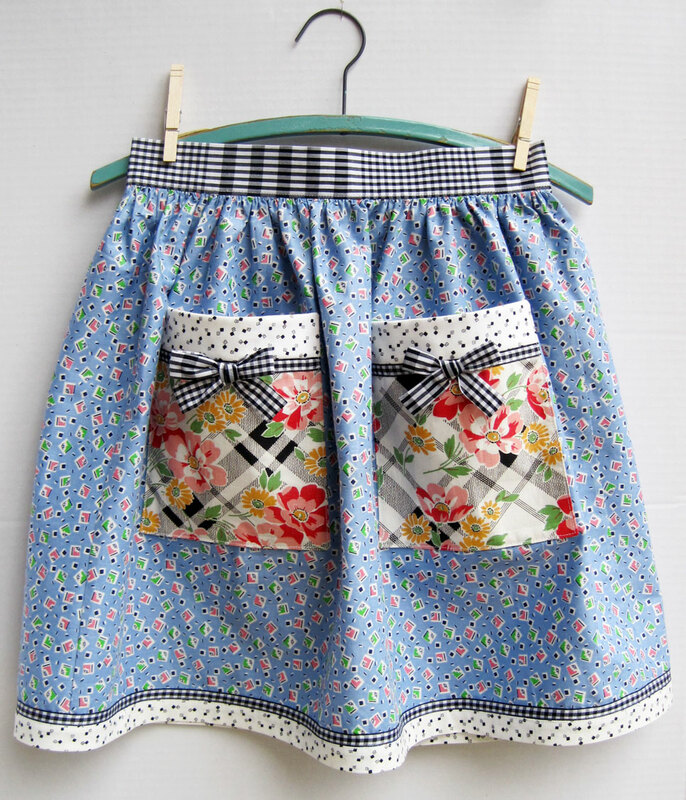 This second apron style I’ve done a couple of times, but I really like the “apron with an apron” look. 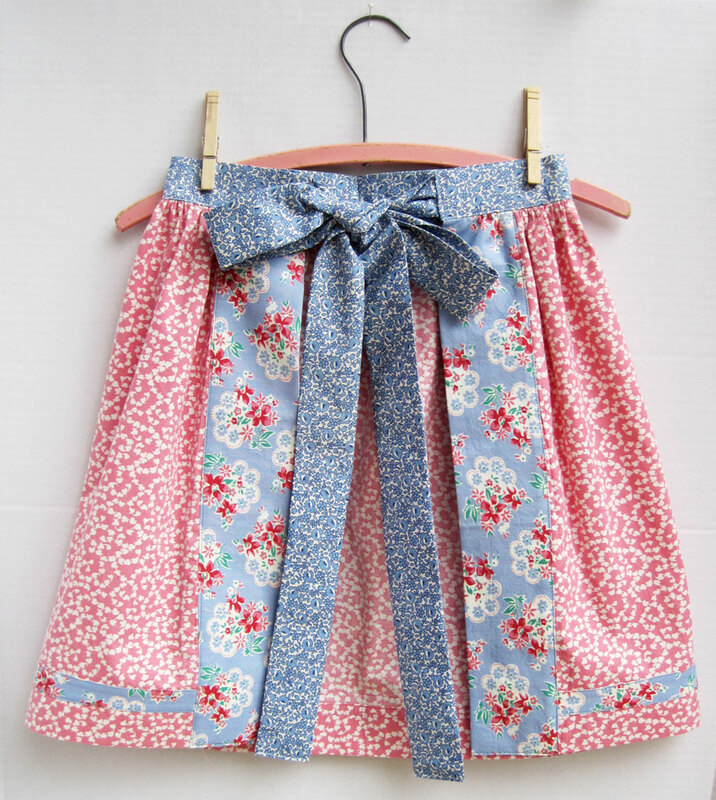 The sweet pink print, napkin and sash are all vintage; the floral trim pieces on the bottom and back edges are new. Originally, I planned to put this napkin on the blue print above, but Emily talked me out of it. I trust her opinion (even though I disagreed at the time), so I hope she likes the way they turned out. The apron inspiration is still going strong. Even though I should probably move on to doll quilts or some other product idea, I don’t want to stop when I’m having this much fun. 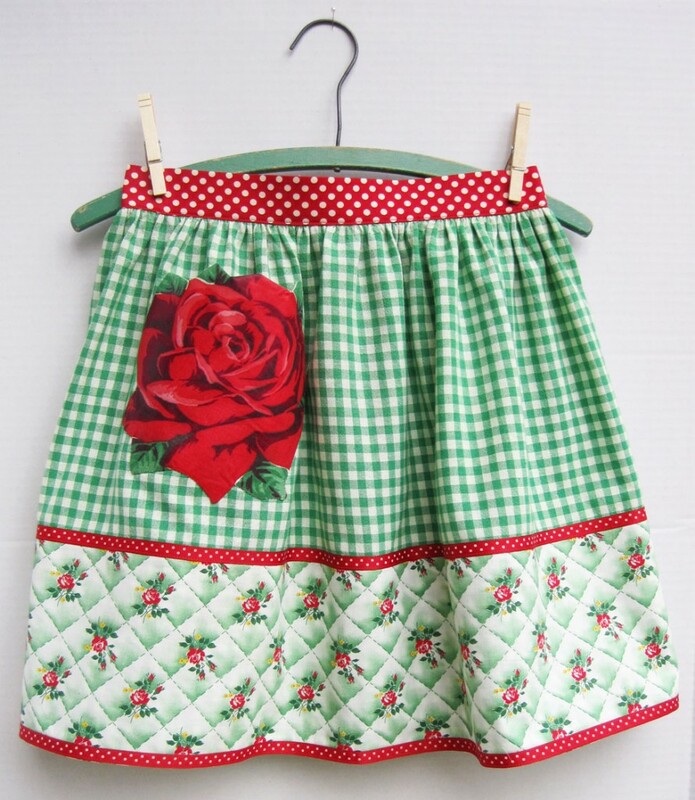 The vintage fabric on the Rose Apron is a sort of cheater quilted fabric. I have several variations of this type of print, and they are all so cute. A novelty pocket has been on my to-do list for the longest time, and I finally came up with an idea. 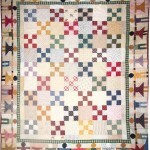 This one is made with a vintage Vogart Everglaze Chintz applique. 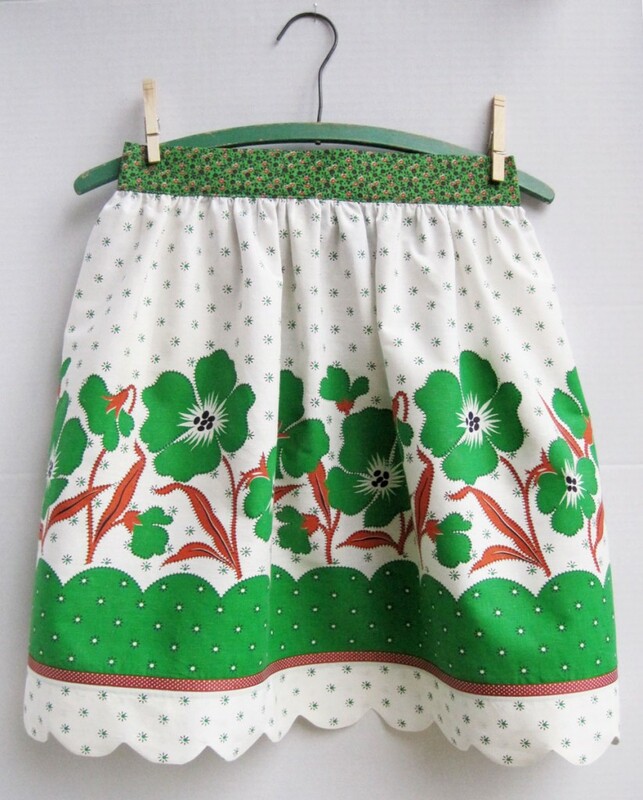 One problem I have when working with narrower width vintage fabric is that a 36″ wide apron is a little skimpy. I try to work around the problem by cutting the piece in half and adding a bit to the width (as above), or using some additional fabric to add a little extra to the sides (as below). 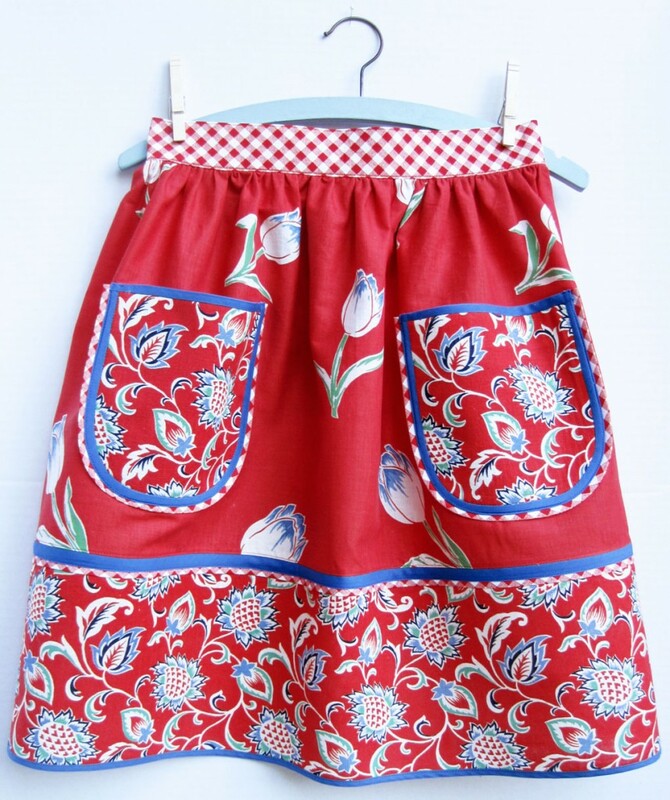 With this border print apron, I used the top of the border fabric to create scallops around the bottom and sides of the apron, creating both length (since I cut off so much from the top) and a little more fullness. I was so happy to find that brown polka-dot ribbon in my giant box of ribbon pieces. The red paisley fabric is not old, but I thought it would look nice with the border fabric (at least after I dyed the white paisleys a light yellow). 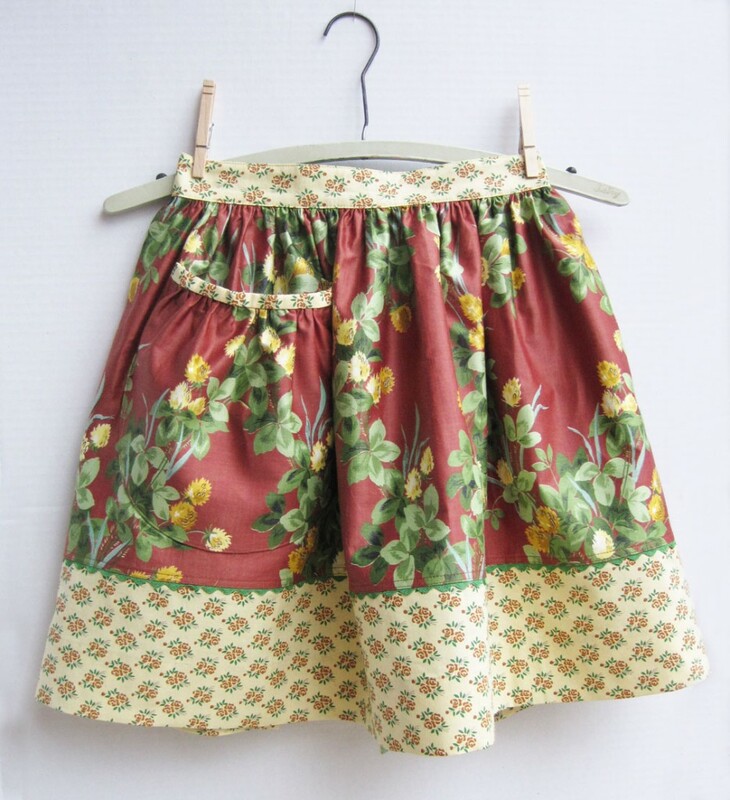 The waistband and sashes are made with a vintage tiny butterfly print purchased years ago, and the pockets and border are trimmed with bright yellow rick rack. 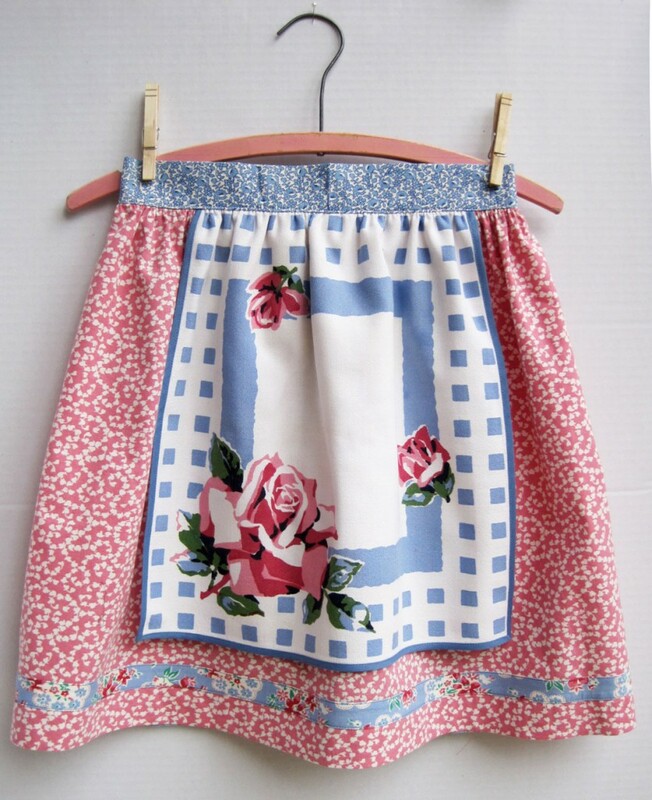 To make these aprons, I cut this cute vintage border print into two pieces, just like I did with the Violet Chintz Aprons. One apron is made with the bottom of the border print, while the other is made from the less interesting top portion of the print. The bottom border apron was easy, with just a bit of checked bias tape and a blue floral print. 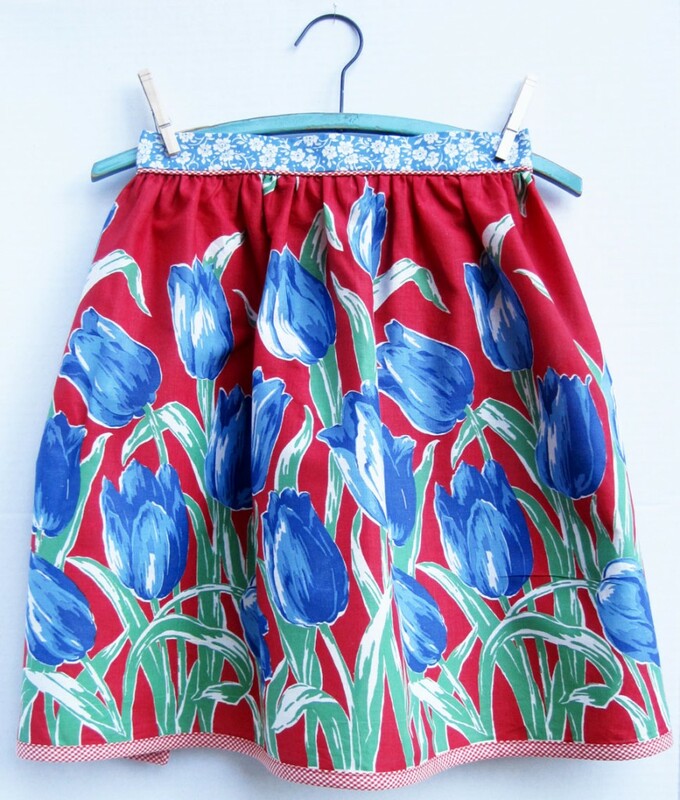 There aren’t any pockets in this one because I didn’t want to mess up the tulip print, but there was just enough bias tape left to add some piping to the waistband. I really like this effect, and plan to do it more often. 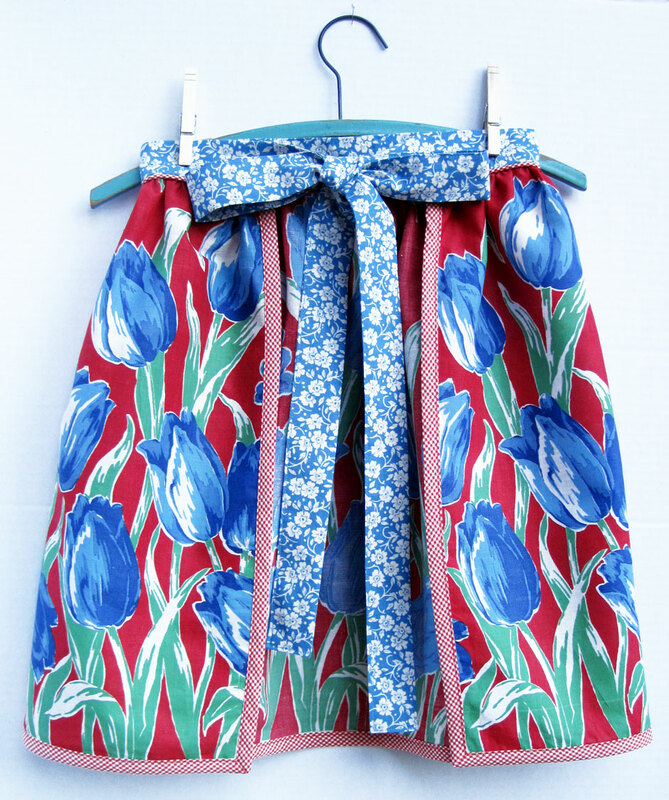 The fabric for the second tulip apron was a little plain, so I added a border and pockets made with one of my favorite feedsacks, together with some vintage unfolded bias tape that came on a humongous roll. Because I felt sort of sorry for this apron (not having the beautiful border tulips and all), I think I went a little crazy with all the trims.